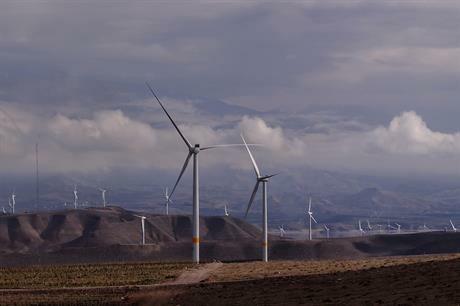 IRAN: The 61.2MW Sihapoush wind farm, the country's largest project, has been fully commissioned, developer Arian Mah Baad has announced. Located in the north-western province of Qazvin, it comprises 18 Siemens Gamesa SWT-3.4-108 turbines. It delivered first power to the Iranian grid in May, and was fully commissioned in August. Iranian company Safa Nicu was responsible for the site’s engineering, procurement and construction (EPC). The project cost €89 million to build and was financed by Iran’s National Development Fund facility and cooperative development bank Tose’e Ta’avon, the developer stated. Siahpoush’s developer Arian Mah Baad is part of the Mahtaab group that owns 13 active power plants throughout the country, including hydro, steam, oil and gas facilities, according to its website. It is considering adding solar PV at the Siahpoush site, the developer added. The Mahtaab group is also developing the 31-turbine 99.2MW Tizbaad wind farm in Razavi Khorasan province in the north-east of the country. It will feature 3.2MW turbines, also manufactured by Siemens Gamesa, and will be commissioned in 2019. Iran now has 203MW of installed capacity, according to Windpower Intelligence, the research and data division of Windpower Monthly. The 61.2MW project is the largest operating in the country, surpassing a 48MW site in Gilan province in the north-west of the country.